This historical fiction novel by Kenneth Oppel takes place in Canada in the late 1880’s. The country is young and exploring its boundaries. The last spike has been driven into two great railway systems, creating a coast to coast system. Now travelers can journey across the country at record speeds but no train exists that is big enough or strong enough to make the full trip until The Boundless arrives. 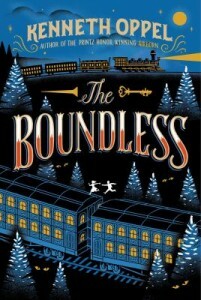 The Boundless was a dream of railway manager Mr. Vanhorn. It pulls over seven miles of train cars including a circus, a gym, a pool, three classes of passengers cars, and much more. Sadly, it also pulls Mr. Vanhorn’s funeral car as he did not live long enough to see his dream built. Surrounded by a current of electricity, Mr. Vanhorn’s car will travel the rails forever as part of the Boundless. But there are many people who would like to get their hands on the treasure that travels along inside the funeral car next to Vanhorn’s body. Only two people know where the key is to unlock the funeral car, the guard hired to protect it, and James Everett. Once a poor employee of Mr. Vanhorn, James saved Mr. Vanhorn’s life three years previous and, in gratitude, James was left everything Mr. Vanhorn owned. James alone knows what and how to get in that car- knowledge that soon endangers his son, William. William is shy and unsure of himself but full of excitement to be traveling on The Boundless’ maiden trek across the country with his father. That is until he witnesses the murder of the funeral car guard and quickly becomes the prey himself. Will, stuck an unplanned adventure, he must out run and outsmart those trying to use him to get to the riches inside the train car. No one is who they seem and even those trying to help Will stay safe and the speeding train has ulterior motives. Can anyone be trusted? Is everyone using him to get inside the funeral car? 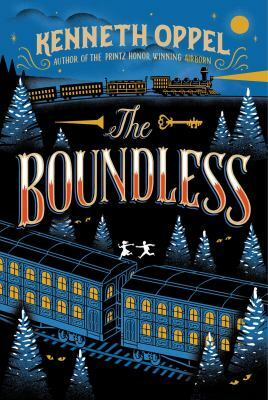 The Boundless tells a wonderful story of a young boy trying to find faith in himself and discover who he truly is. This is a grand adventure full of mysterious creatures and strange magical happenings that no reader should miss. There is also a book trailer which you can view by clicking here. This entry was posted in Reviews and tagged Boy's Adventure Tales, Canada, Historical Fiction, Lindsay, Railroads on October 13, 2015 by Tony.